Eliminate pond muck and sludge that accumulates at the bottom of your pond with Pond Logic MuckAway. 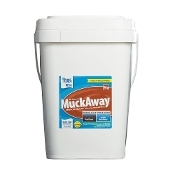 The specially formulated strains of beneficial aerobic bacteria in MuckAway are designed to quickly digest organic debris like fish waste, leaves twigs, plant decay and organic runoff that accumulate and form pond muck without harming your pond or its inhabitants. Pond Logic MuckAway is great for removing pond muck from high traffic beach areas and lake shorelines where you love to walk and swim so you can feel sand between your toes instead of pond muck. By reducing excess nutrients and muck from your pond, Pond Logic MuckAway eradicates pond odors, helps slow weed growth and keeps your pond water clear and balanced. Pond Logic MuckAway is delivered in a powerful tablet designed to sink to the pond’s bottom, taking the fight to pond muck’s doorstep. 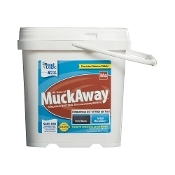 Pond Logic MuckAway is a completely natural product. 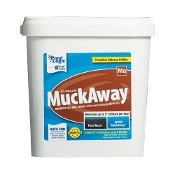 When used in accordance with label directions MuckAway is completely safe for your fish, plants, pets and pond wildlife.